Little, Brown & Co., Essex, UK, 2006. I found Between Mom and Jo, told from the point of view of a teenage boy, Nick, to be a well-written, heart-pulling reminder about just what it is we take on when we chose to become parents and how it feels to be the child torn by his moms’ separation. As Nick tells the story of his moms’ break up and the aftermath, he reminded me of the responsibilities of the bonds we create as parents with our kids. Bonds that have a real and deep life of their own, separate from our relationship with the child’s other parent(s). The frankness with which Julie Ann Peters has Nick tell his story is catching and effective. In this young adult novel, Peters captures the complexity of the two mom family she created—both the impact on Nick of having two moms and the issues between those two moms, including their families, class, personal struggles with alcoholism and breast cancer, and ultimately, their struggles with figuring out how to love Nick as his moms even when they are no longer together. 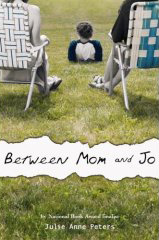 Between Mom and Jo is also an crucial addition to those libraries. As the “other” mom in my own family, and well aware of the strains that having a wonderful son (now 6 years old) has put on my relationship with his mom (sometimes known as my lover, girlfriend and partner) this book really spoke to me personally. I imagine that it would be equally realistic and emotionally personal for many young adults. As Nick tells the story of his moms’ break up and the aftermath, he reminded me of the responsibilities of the bonds we create as parents with our kids.